Harry Carr is the owner of Mint Creek Farm in Stelle, Illinois — about 85 miles southwest of Chicago — where he and his family have raised pastured, grass-fed livestock since 1992. That makes them among the pioneers in producing local grass-fed meat for the populous Chicago market. 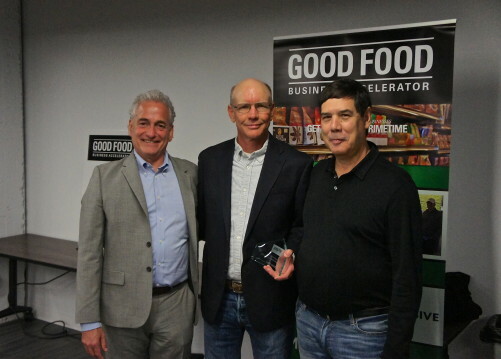 But they are looking for ways to scale up to meet the fast-rising consumer demand for the kinds of products they produce, which is why Carr was a member of the first class of Fellows in FamilyFarmed’s Good Food Business Accelerator, which concluded its six-month session earlier in May. Here Carr expresses his passionate views on the advantages of grass-fed over grain-fed beef. Back when my family and I started Mint Creek Farm in the 1990s, few American consumers had even heard of grass-fed beef, no less bought it for their dinner tables. That has changed dramatically, as demand (for reasons discussed in this column) is soaring. The nonprofit Wallace Center at Winrock International reported that retail sales of grass-fed beef leaped from $5 million nationally in 1998 to $400 million in 2013. Yet grass-fed still is just a fraction of the overall U.S. beef market, which is dominated by cattle that end their lives being fattened with grain at concentrated animal feeding operations, or CAFOs. There is still plenty of consumer confusion about the advantages of grass-fed, and plenty of pushback from conventional producers who argue there are no real benefits to choosing grass-fed beef over grain-fed. At the very least, most people have not heard the counterargument from a farmer who has devoted the past 23 years to raising grass-fed livestock and helping to build a market for it. I’ll start by mentioning a few important considerations about grass-fed beef. These are not the meat of my argument, but they are important details for your attention. * Health considerations of grain-fed vs. grass-fed meat. I believe there to be many health benefits to grass-fed meats versus grain-fed. The much higher omega-3 and conjugated linoleic acid content, for starters. I am no nutritionist, however, and there are better people to make this argument. * Taste preferences. Eat to please yourself, wear lamb’s wool underwear to please others. * Should we be eating meat at all? Good question! The BBC program “The Ascent of Man” by Jacob Bronowski touched me very deeply when I first saw it as a teenager. Here is a link to a clip of Bronowski discussing our human arrogance and where it has led us. Cows prefer it! At Mint Creek Farm, we feed our cattle on hay over a several-acre area to make it through winter. The cows wanted to get out and graze the fresh grass. Wouldn’t you? Tired of chasing them back in, today we moved them out in mid-April. Yeah!!! They click up their heels in pleasure. Cattle at Mint Creek Farm graze on central Illinois pasture, about 85 miles south of Chicago. There are superior environmental benefits to raising cows on grass. 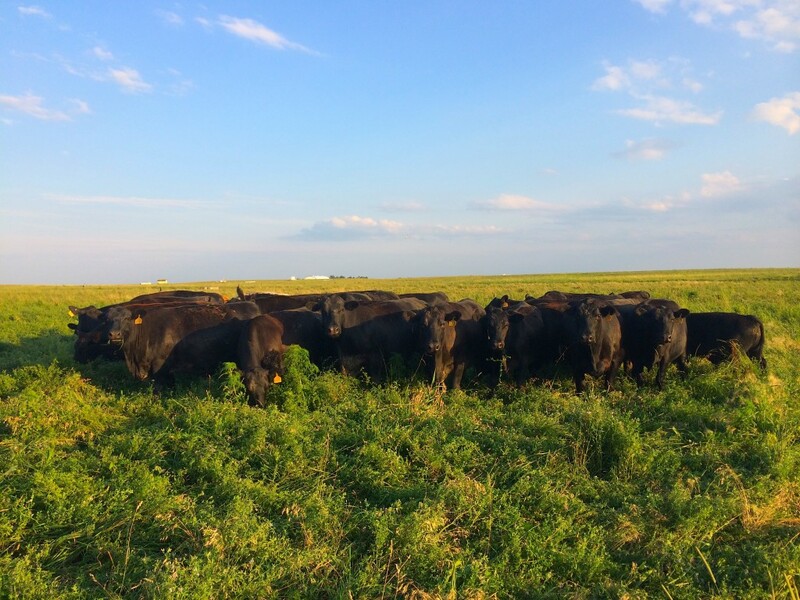 We graze our cattle in a way that mimics the movement of the buffalo on the tallgrass prairie. Every one to two days, the cattle are moved to a new area. As they graze the pasture, some of the plants are consumed, while some are trampled, creating thick mulch on the soil surface. This thick mulch holds in soil moisture and supplies soil organisms with food. As the aboveground part of the plant is eaten or trampled by the cow, the below ground roots also die back. This dieback of roots is the main source of soil building, and one of the greatest and most essential parts of the carbon cycle, pumping carbon back into the soil where it belongs. 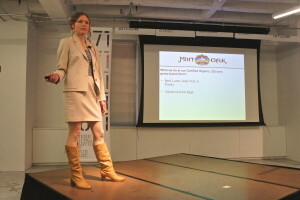 Raya Carr, daughter of Harry Carr and Mint Creek Farm’s sales manager, also participated in FamilyFarmed’s Good Food Business Accelerator, and is seen here doing a pitch for the business at the program’s Demo Day on April 27. Through the course of the grazing season, this process can happen about five to seven times. This creates topsoil at a rate approximately five times what otherwise would be possible. The perturbation of the soil surface increases biodiversity and stimulates biological processes. This is how the tallgrass prairie built topsoil five feet thick, much of which has been lost by our present method of crop farming. On the other side of the coin, growing crops to supply grain-fed confinement cattle also requires a monoculture, because harvesting equipment can only harvest one crop at a time. David Tilman of the University of Minnesota has shown that a perennial polyculture like the tallgrass prairie can achieve more than twice the productivity of monocultures. Polycultures are easy to do organically, as there are no weeds. The animals eat everything that grows, therefore no need for herbicides and pesticides. Perennial polycultures require no seed and enhance the biodiversity of flora and fauna. They provide a haven for the wonderful and disappearing native species of songbirds, which are mostly missing from our croplands. Raising cattle on grass uses much less fossil fuel and is more energy efficient than grain feeding. When cattle are raised in confinement and fed grain, the manure that builds up is washed into a holding pond and spread with a machine powered by a tractor. Cows raised on pasture spread their own manure. As Wendell Berry points out, modern-day agriculture has taken a solution and turned it into two problems. Grassfed is more fun and healthier for the farmer! Moving the cows from paddock to paddock requires lots of walking. Getting off the tractor and connecting with the natural world is a beautiful thing. We love to worship our machines, but frankly the biological world is a whole lot more interesting. Since animals in confinement can be mostly cared for by machine, there are fewer labor requirements. To the farm accountant that may be a good thing, but to the social steward and state department of unemployment, it is not such a good thing. How beautiful would it be for the state of Illinois to turn its 12 million acres of corn and 9 million acres of soybeans (three-quarters of the entire state), which mostly get exported, into a bountiful grassland paradise employing 10 times the people, rejuvenating local economies, making Illinois self-sufficient in feeding its population, and balancing the state’s budget with all the dollars kept local! 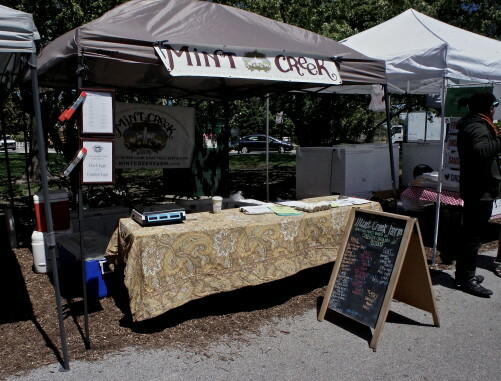 Mint Creek sells its pastured-raised meat and eggs at several Chicago-area farmers markets, including Green City Market in the city’s Lincoln Park neighborhood (seen here). If I multiply that number by the number of acres Mint Creek Farm utilizes, it exceeds my total labor expense by a considerable amount. In other words, just the input costs of a corn crop exceed the total labor cost of our grass-fed livestock model. Since the sun does not charge us for shining, the perennial grass grows for free. The animal eats the grass and moves on spreading its free fertilizer. When all the costs are considered, raising grass-fed beef is clearly less costly than grain feeding. We have not even engaged in the growing controversy over the rising concerns about overuse of antibiotics on livestock in crowded conventional feedlots. As this article by Dr. Joseph Mercola on his Mercola.com website underscores, there is a growing body of evidence that these practices are producing antibiotic-resistant bacteria — “superbugs” — that have devastating health consequences for people who become infected. It becomes clear that the future belongs to grass-fed. And finally, biodiversity is very important to our long-term sustainability. In Bringing Nature Home, Douglas Tallamy shows the huge role that herbivorous insects play in the web of life that sustains us. 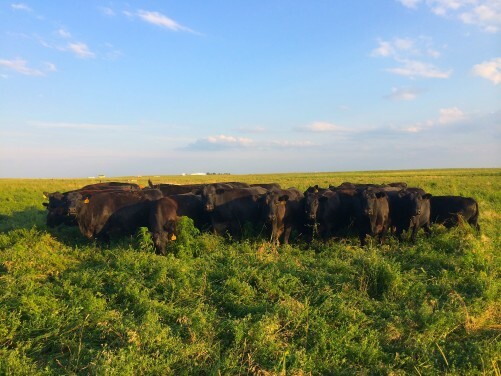 A perennial grass-fed model with controlled grazing of livestock and long rest periods can increase biodiversity and the total energy available in the ecosystem. The pasture is a great place to visit! People love coming to our farm for tours, walking around the pasture, and saying hi to the cattle cows. Because we raise our own brood stock and keep the calves with the cows, they are one big happy family, never having to live a life separate from their kin. Family is as important to them as it is to us! Please do come visit us. Check out our events page at www.mintcreekfarm.com. This entry was posted in Antibiotics in meat, Beef, Farm businesses, Farmers markets, Food and health, Food Entrepreneurs, Good Food Business Accelerator, Good Food business development, Good Food marketing, Grass-fed beef, Livestock farming, Meat, Organic farming, Small Farmers, Sustainable food business investment, Sustainable food retailing and tagged FamilyFarmed, farmers markets, Good Food Business Accelerator, Grass-fed beef, Grass-fed vs. grain-fed beef, Harry Carr, meat, Mint Creek Farm, sustainable livestock production, sustainable meat. Bookmark the permalink.